As with every version, Commands and Variables change: AutoCAD LT 2015 is no different. Below is a list of what we discovered to date that we thought would be of interest to you. GEOMAPIMAGE: Captures a portion of the online map to an object known as a map image, and embeds it in the drawing area. GEOMAPIMAGEUPDATE: Reloads map images from the online maps service and optionally resets their resolution for optimal on-screen viewing. 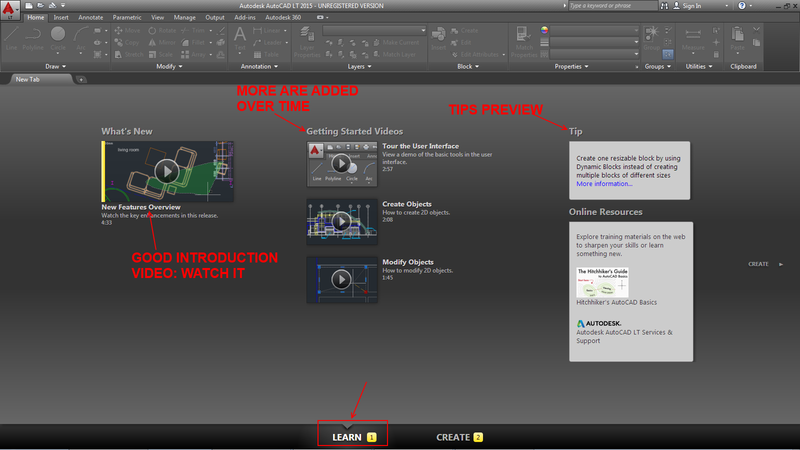 NEWTAB: Displays a New Tab which allows direct access to files, learning resources, Autodesk 360 and more. ONLINEAUTOCAD360: Launches AutoCAD 360 in your default browser. PTYPE: Specifies the display style and size of point objects. TEXTALIGN: Aligns multiple text objects vertically, horizontally, or obliquely. COLORTHEME: Sets the color theme of the ribbon, palettes, and several other interface elements to dark or light. COMMANDPREVIEW: Controls whether a preview of the possible outcome of the command is displayed. COMPLEXLTPREVIEW: Controls whether a preview of the complex linetype is displayed during interactive operations. HIGHLIGHTSMOOTHING: Controls the anti-aliasing effect on object highlighting. HPLINETYPE: Controls the display of linetype in a hatch pattern. LAYOUTTAB: Controls whether Model and Layout tabs are displayed or not. MTEXTAUTOSTACK: Controls autostacking for the MTEXT command. MTEXTDETECTSPACE: Controls whether the keyboard spacebar is used to create list items in the MTEXT command. NEWTABMODE: Specifies whether clicking the plus sign (+) on the file tab bar displays the New Tab or opens a new drawing. OSNAPOVERRIDE: Determines whether the object snap settings in the OSNAP dialog are enforced. POINTCLOUDLIGHTING: Controls the way lighting effects are displayed for a point cloud. POINTCLOUDLIGHTSOURCE: Determines the light source for point clouds when lighting is turned on. POINTCLOUDLOD: Sets the level of density of point display for point clouds. POINTCLOUDPOINTSIZE: Controls the size of the points for new point cloud objects. POINTCLOUDSHADING: Specifies whether the brightness of the points in the point cloud are diffuse or specular. POINTCLOUDVISRETAIN: Controls whether a legacy drawing (created in AutoCAD 2014) retains the on or off status of individual scans (RCS files) and regions referenced by an attached point cloud project (RCP file). SORTORDER: Specifies whether the layer list is ordered using a natural sort order or ASCII values. STATUSBARSTATE: Indicates whether the status bar is visible or not. TEXTALIGNMODE: Stores the alignment option for aligned text. TEXTALIGNSPACING: Stores the spacing option for aligned text. TEXTALLCAPS: Controls automatic correction for MTEXT and TEXT/DTEXT when CAPS LOCK is active. TEXTAUTOCORRECTCAPS: Controls whether or not Caps Lock is automatically turned off for Multiline text and Text. ARCHIVE: Packages the current sheet set files for storage. Removes the capability for creating EXE files due to security concerns. Files can only be packaged into ZIP files. The ability to add a password has also been removed. 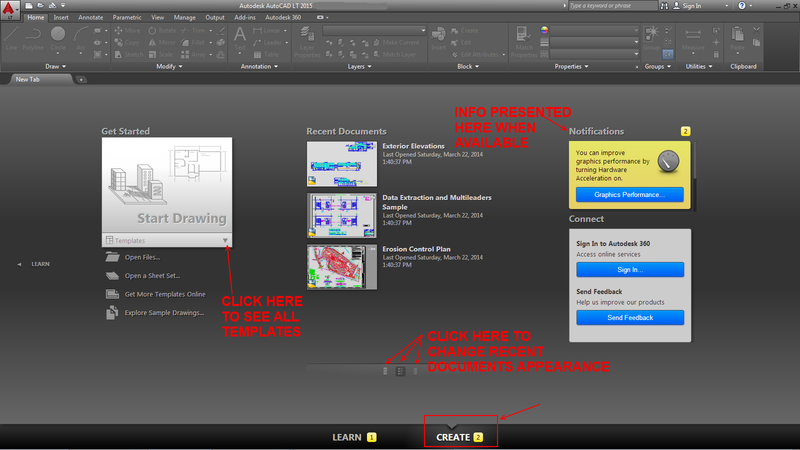 ATTACH: Inserts references to external files such as other drawings, raster images, and underlays. Removes support for legacy PCG and ISD files. CLIP: Crops selected objects such as blocks, external references, images, viewports, and underlays to a specified boundary. No longer supports clipping of point clouds. For point clouds, use POINTCLOUDCROP. DWGCONVERT: Converts drawing format version for selected drawing files. Removes the capability for creating EXE files due to security concerns. Files can only be packaged into ZIP files. The ability to add a password has also been removed. ETRANSMIT: Packages a set of files for Internet transmission.bRemoves the capability for creating EXE files due to security concerns. Files can only be packaged into .ZIP files. The ability to add a password has also been removed. GEOGRAPHICLOCATION: Assigns geographic location information to a drawing file. Prompts and the dynamic display behavior when specifying the location of the geographic marker and the north direction have changed. GEOREORIENTMARKER: Changes the north direction and position of the geographic marker in model space, without changing its latitude and longitude. Prompts and the dynamic display behavior when specifying the location of the geographic marker and the north direction have changed. GRAPHICSCONFIG: Provides access to display performance-related options. Now displays the Graphics Performance dialog box. IMAGEADJUST: Controls the brightness, contrast, and fade values of images. Enhanced to apply to map images. MTEXT: Creates a multiline text object. Adds subscripting and superscripting features, and Caps Lock detection. Enhances options for creating numbered and bulleted lists and automatic text stacking. OPTIONS: Customizes the program settings. In the System tab, Balloon Notifications, removes the option to display live update notifications. 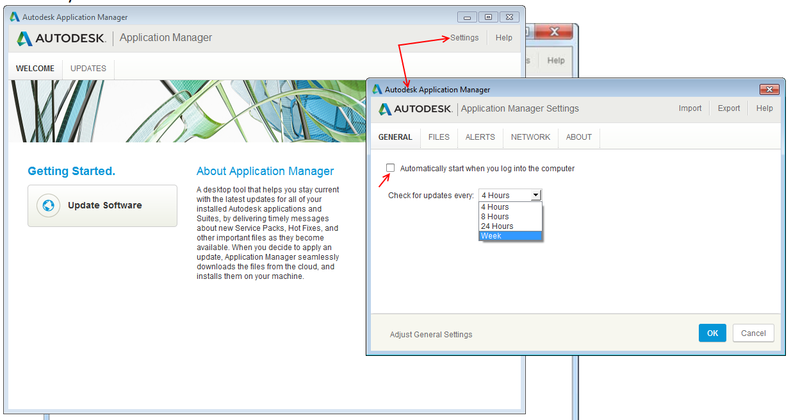 Live updates are now managed by the Autodesk Application Manager. OVERKILL: Removes duplicate or overlapping lines, arcs, and polylines. Also, combines partially overlapping or contiguous ones. Can now be used in the Block Editor. POINTCLOUDATTACH: Inserts an indexed rcs (single scan) or rcp (multiple scan project) file from Autodesk ReCap in the current drawing. Removes support for legacy PCG and ISD files. 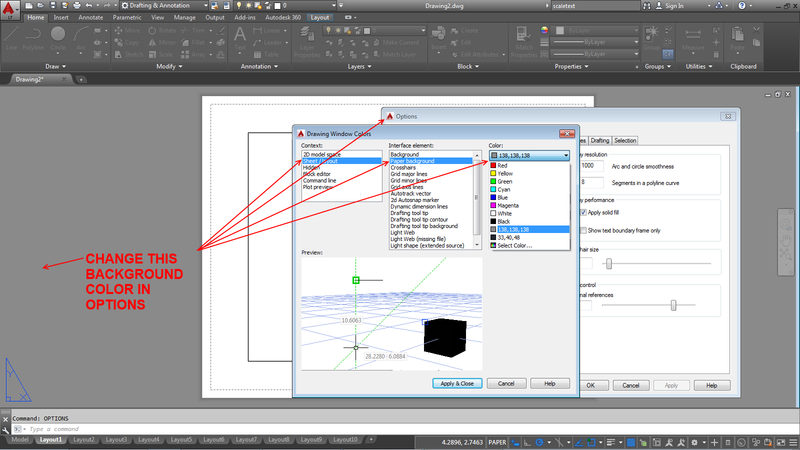 PURGE: Removes unused items, such as block definitions and layers, from the drawing. Adds support for removing orphaned data such as DGN linestyles. DIMCONTINUEMODE: Determines whether the dimension style and layer of a continued or baseline dimension is inherited from the dimension that is being continued. Layer of continued dimension is inherited. FRAME: Controls the display of frames for all images, map images, underlays, clipped xrefs, and wipeout objects. Enhanced to apply to map images. IMAGEFRAME: Controls whether image frames are displayed and plotted. Enhanced to apply to map images. OSOPTIONS: Controls whether objects snaps are suppressed on hatch objects, geometry with negative Z values, or dimension extension lines. End points of dimension extension lines are ignored by default. PICKAUTO: Controls automatic windowing for object selection. 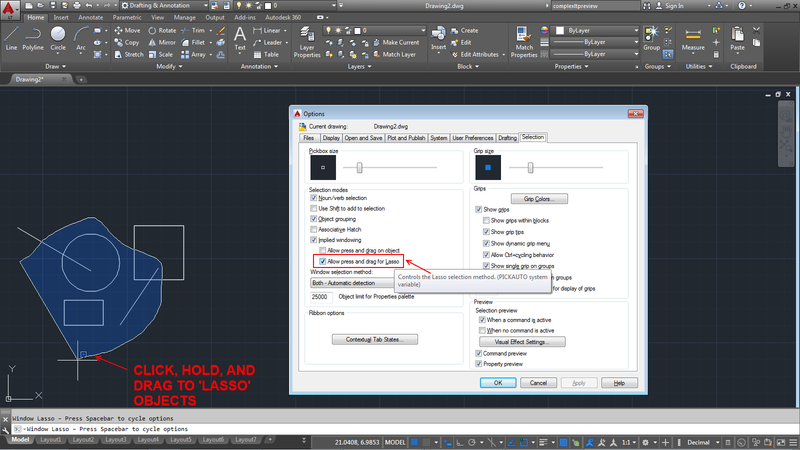 Adds Lasso (window and crossing) selection, enabled by default. POINTCLOUDAUTOUPDATE: Controls whether a legacy point cloud is regenerated automatically after manipulation, panning, zooming, or orbiting. Applies only to legacy (pre-AutoCAD 2015) point cloud objects. POINTCLOUDBOUNDARY: Controls whether the point cloud bounding box is displayed. Added an option to display the bounding box only when the point cloud is selected. POINTCLOUDCACHESIZE: Specifies amount of memory (in megabytes) that the internal processing engine will use for point clouds. Value can now be changed to an integer expressing a number of megabytes. POINTCLOUDCLIPFRAME: Determines whether point cloud clipping boundaries for legacy (PCG, ISD and RCP) point clouds are visible or plotted in the current drawing. Now affects only legacy point clouds. POINTCLOUDDENSITY: Controls the percentage of points displayed for all legacy point clouds in the drawing view. Applies only to legacy (pre-AutoCAD 2015) point cloud objects. POINTCLOUDPOINTMAX: Sets the maximum number of points that can be displayed for all point clouds attached to the drawing. Default (and maximum) value now 10 million points. Does not affect legacy (pre-AutoCAD 2015) point clouds. POINTCLOUDRTDENSITY: Improves performance by degrading the number of points displayed while zooming, panning, or orbiting. Applies only to legacy (pre-AutoCAD 2015) point cloud objects. PREVIEWFILTER: Excludes specified object types from selection previewing. Default value changed from 7 to 3. SELECTIONPREVIEWLIMIT: Limits the number of objects that can display preview highlighting during a window or crossing selection. Default value changed from 2000 to 20000. STARTUP: Controls what displays when the application is started, or when a new drawing is opened. Updated to support the New Tab design (option 3). STATUSBAR: Controls the display of the status bar. The application and drawing status bars are merged. DASHBOARDSTATE: Determines whether the Dashboard window is active. PREVIEWEFFECT: Specifies the visual effect used for previewing selection of objects. RIBBONCONTEXTSELECT: Controls how ribbon contextual tabs are displayed when you single- or double-click an object. DDEDIT: Edits single-line text, dimension text, attribute definitions, and feature control frames. Replaced by TEXTEDIT. DDPTYPE: Specifies the display mode and size of point objects. Replaced by PTYPE. DDVPOINT: Sets the 3D viewing direction. Replaced by VPOINT. ONLINECOLNOW: Starts an online session with AutoCAD WS, in which people that you invite can simultaneously view and edit your current drawing. Replaced by ONLINEAUTOCAD360, which opens AutoCAD360. Autodesk announces the release of the newest AutoCAD LT version today, the 2015 version: they continue what they started in the 2013 and 2014 versions, adding a host of customer driven additions, tweaks, and even some performance enhancements. True, there are no ground-shaking new features being introduced, but based solely on my time with this version to date I have to note that I've been smiling to myself the whole time I've been using it. 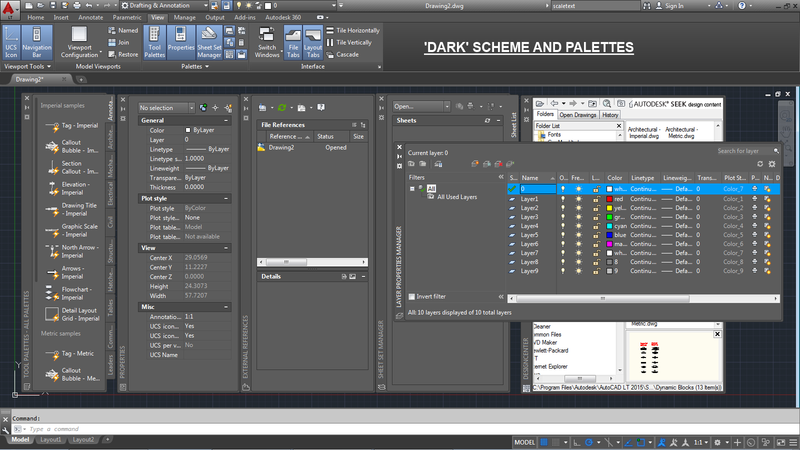 User Interface: Dark Scheme Option. Suffer from Eye-strain? 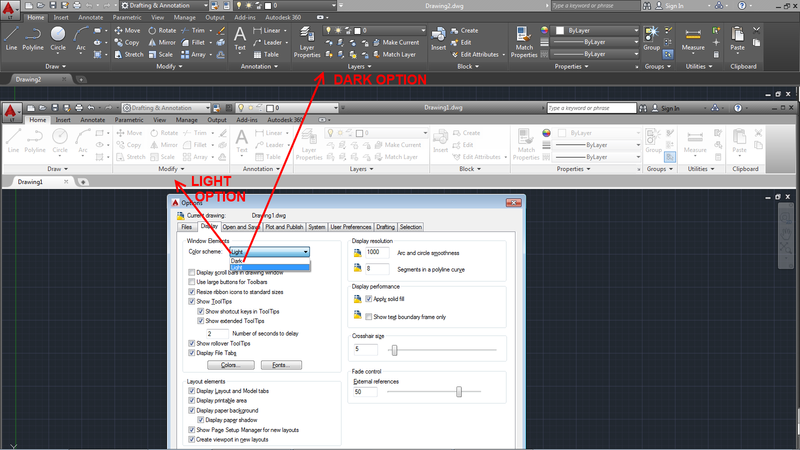 This new option should help: Autodesk introduces the new Dark Scheme for the entire user interface. If you stare at a 25"-27"-30" monitor(s) all day long using AutoCAD, this is going to feel very comfortable. Check out these screenshots. Don't like it? Can't stand anything new? No fear, you can go back to the 'white' Light Scheme from 2014 and earlier. You have HELP up and you are reading about a command: where do you start looking for it? 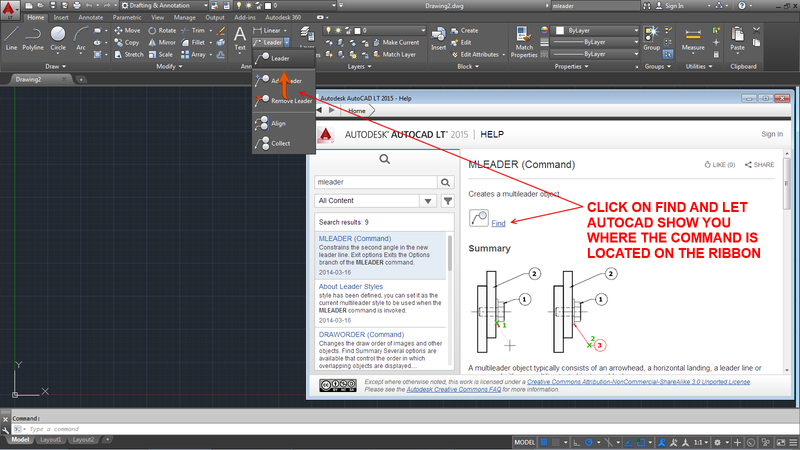 In AutoCAD LT 2015, where available, simply click on the find tool on the command description page to display an animated arrow in the UI showing the exact location of the command. Check it out. 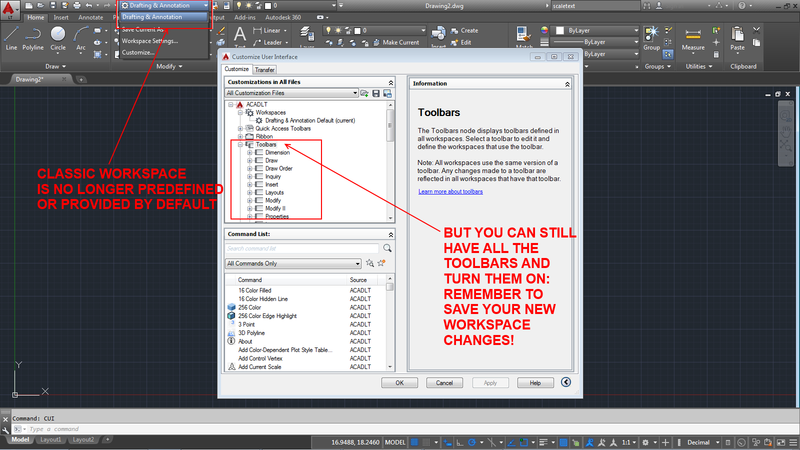 AutoCAD LT 2015 is not provided with the old Classic Workspace OOTB (Out Of The Box): if you want it, you will have to create it yourself (most the parts are still in the CUI command) if you cannot transfer it's parts from an older AutoCAD LT version. Autodesk cleaned up the Ribbon's View Tab. 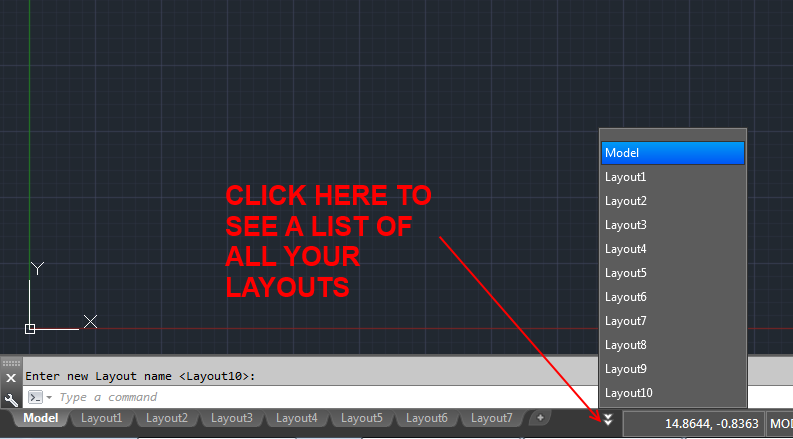 In AutoCAD LT 2015, you can quickly add a new layout by clicking on the + sign available where your Layout Tabs hang out. Losing track of your Layouts in a file? Now you can quickly display them all too. Oh, and have you always wanted to change that gray background that hovers all around your "page" in a Layout? 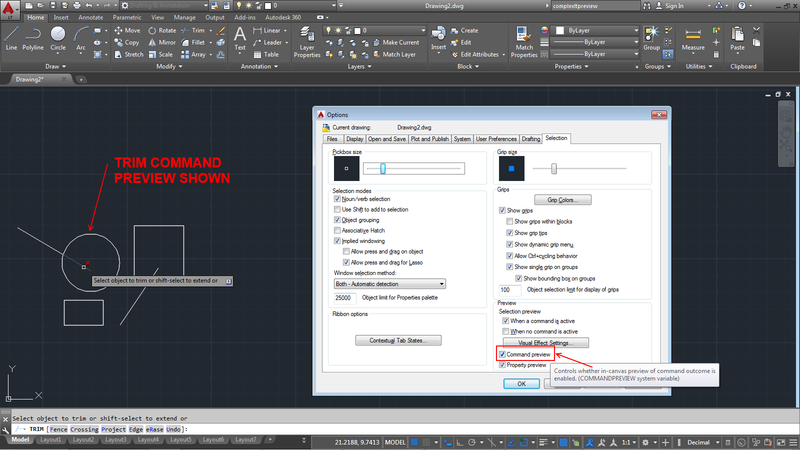 AutoCAD LT 2015 now lets you do just that. New variable in AutoCAD LT 2015 enables you to turn on anti-aliasing of drawings in viewports (with 2D wireframe) to make 2D objects look smoother. This is a display-only feature, printing is not affected. AutoCAD LT 2015 offers more visual feedback than previous versions. For example: when you Move an object, the original location of the object is displayed as a faded outline while it moves. Same with Copy, Rotate and more. Even more complex objects hold their shape when you using any of the same 'modify' tools. I'm sure you wondered why I used that word in the title of this blog post: In AutoCAD LT 2015 you can click and drag in the drawing window to create a lasso completely free-form selection method around only the objects you want in a very busy drawing area. You can of course turn that feature off if it is too powerful for your daily needs. Do you use them? AutoCAD LT 2015 enhances them and offers more flexibility with their use. Once created, a bright blue boundary clearly identifies the active viewport you are in. You can easily resize any of the viewports by dragging the horizontal or vertical boundaries. Layer lists display using natural ordered sorting in AutoCAD LT 2015: so instead of the layer names being sorted as 1, 10, 2, 25, 21, 4, 6 etc. they now are displayed as 1, 2, 4, 6, 10, 21, 25 and so on. Dislike this idea? Set this variable to 0 (that's a zero) and the old method is restored. A new tool on the status bar in AutoCAD LT 2015 provides you with one-click access to set an isometric drafting environment. Turn it on by selecting one of the options from that flyout menu. Turn it off by simply clicking on the icon you previously selected. The Mtext Editor background is transparent (you can see all the objects behind it) if your AutoCAD LT 2015 is using hardware acceleration. Column Resizing is more intuitive: resize columns height and width by passing the cursor over the bottom or right edges of the text editor then click and resize. 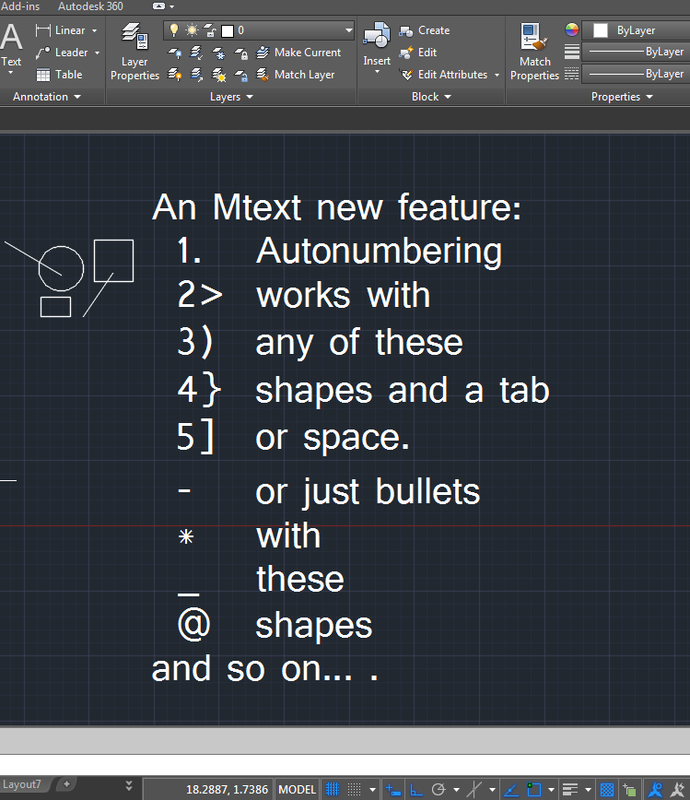 If you turn on Allow Auto Bullets and Numbering in the Mtext Editor Ribbon tab, then when you begin a line with a symbol or with a number or a letter followed by one of these characters and a space or tab, AutoCAD LT 2015 automatically creates a bullet or numbered list: ". ", ",", ")", ">", "}" or "]". Pressing backspace immediately after pressing the space or tab key removed automatic bullets and numbering. 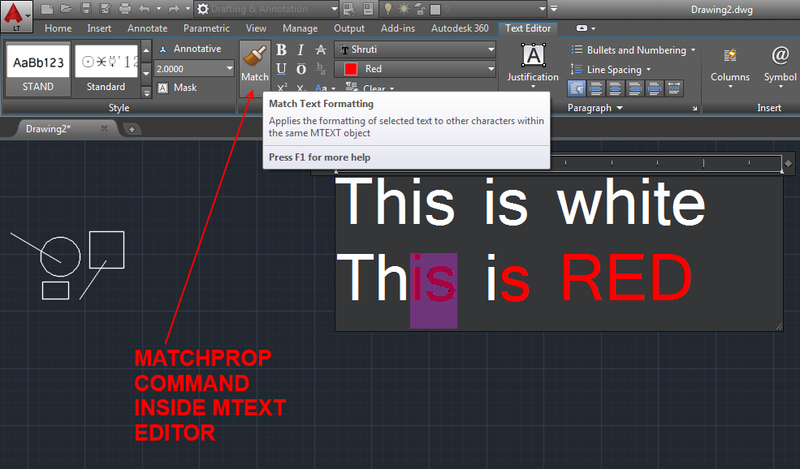 The Mtext Editor recognizes the Caps Lock key (assuming you don't type in all caps and have auto-caps turned on in Mtext): AutoCAD LT 2015 automatically turns off the Caps Lock and fixes the first letter that you typed if you pressed the Shift Key then released it. For example: instead of fAVROTES it is corrected to read Favorites. Autostack in Mtext is easier: enter numbers with a forward slash, like 1/20, and AutoCAD LT 2015 automatically treats it as a fraction and changes it. An icon appears next to it: tap that icon and access all the relevant controls for that stacked fraction (including the option to un-stack it). tooltips have been added to the tab tool and markers in the Mtext editor to make it easier to create and edit paragraph tabs. A new Modify button in the Paragraph dialog box offers easier editing of existing tabs. The Mtext Editor now have a Match Properties tool: in fact, it's available for use in Dimsneions and Tables too. 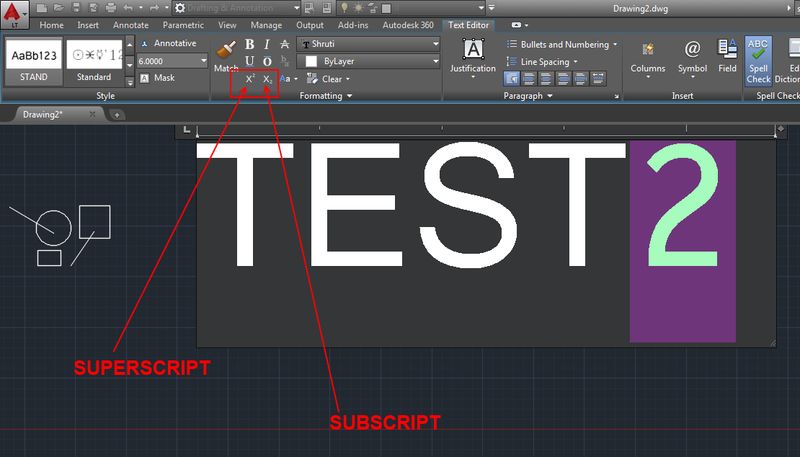 Need to add Subscript or Superscript in your Mtext? Now there are buttons on the Ribbon to create them. This new command is used to quickly align single and multi-text and attributes to other text objects or to user-selected points. These get a small but important fix: in Options command's Drafting Tab, under Object Snap Options, you can set AutoCAD LT 2015 to ignore existing dimension extension lines from being inadvertently snapped to while attempting to pick nearby objects. AutoCAD LT 2015 can now fillet polyline arc segments. You can also press the CTRL key while creating a polyline arc to draw it in the opposite direction. If this is an important tool for your work, you cans till use the tool to enter latitude and longitude for the location if you are not logged into Autodesk 360. A new Use Maps button is added at the center of the display in case you need to change. This new palette provides a way of adding message and images to a drawing, which you can then share with colleagues, project team members, clients and consultants online through Autodesk 360. The Design Feed posts are available in your drawing whether you access them on the desktop, on the web, or a mobile device. As an alternative to storing drawing files in your Autodesk 360 account, AutoCAD LT 2015 enables you to store your files locally on your PC or company server for use with the Design Feed. You control access to your drawing files with your Server's Permissions settings. You can now use Portable Network Graphics (PNG) files for Ribbon and Toolbar Button images in addition to the old BMP file format. Note: Desktop Subscription seats are tied to the user, not a geographic location. Buy in the U.S. and use it anywhere in the world. And if you are on subscription you can pick up extra licenses for only US$360/Year each. OVERKILL command now works in Block Editor. PURGE command now removes orphaned data such as DGN linestyles. Get the latest updates for all your Autodesk products with this newly added Windows Desktop Tool that is installed with AutoCAD LT 2015 (unless you spot it and stop it from doing so). No more hunting through Autodesk's website to find them. Note: after about a day this tool's first action is to install it's own update. Remember to change it's behavior to suit your preferences. Watch this video HERE (if it's still up) for a quick look at the new AutoCAD/LT 2015. AutoCAD LT 2015 is supported in Windows 7 and Windows 8/8.1 only, in 32-bit (for very casual users on slow/old hardware) and in 64-bit (recommended for everyone else). The Autodesk Subscription downloads reveals a new LT feature: Network Licensing for AutoCAD LT2015 is now available (you need more than a single license). Not an option in LT2014 or earlier. More information to follow. Zoom Extents: double-click the scroll wheel button of your mouse. Pan: just press and hold the wheel button and move your mouse. LT2014's EXTERNALREFERENCES: Adds the ability to convert xrefs between overlays/ attachments PLUS change a path to be absolute. LT2014's DIMCONTINUE: By default, the continued dimension now inherits the style of the dimension that is being continued. DIMCONTINUEMODE. LT2014's DIMBASELINE: By default, the baseline dimension now inherits the style of the dimension that is being continued. DIMCONTINUEMODE. LT2014's CONVERTPSTYLES: Now retains spaces in the names of converted plot styles. LT2014's CHAMFER: Now chamfers the first and last segments of an open polyline to create a closed object. LT2014's ARC: Adds the ability to create arcs in a clockwise direction by holding down the Ctrl key as you drag. LT2014's PROPERTIES: Xref-dependent linetypes are no longer displayed in the Preferences window. LT2014's MTEXT: Annotation scale in the Select Annotation Scale dialog box is set only with a drop-down list (no direct entry). LT2014's LAYER: Now adds the ability to merge selected layers by using the shortcut menu in the Layer Manager. LT2014's LAYER: Now uses natural language sorting for the layer list, so that numerals are sorted in order of their values. LT2014's HATCH: Adds Undo to command prompts. LT2014's TEXT: Adds Left to the Justification prompt options. Retains the last used justification during the session. LT2014 New Variable TOUCHMODE: For those using a touch-enabled screen or interface, controls the display of the Touch panel on the ribbon. LT2014 New Variable TEXTJUSTIFY: Displays the default justification used by the TEXT command to create single-line text. LT2014 New Variable CLAYOUT: Sets the current layout. Great add for customizations. LT2014 New Command ONLINEOPENFOLDER: Opens your local Autodesk 360 folder in Windows Explorer. LT2014's INSERTSEARCHOPTIONS: Controls settings for working with AutoComplete and AutoCorrect suggestions on the command line. LT2014 New Command FILETAB: Displays the File tabs at the top of the drawing area. FILETABCLOSE to hide the File tabs. LT 2014: FILLET command can now be used to close a pline. LT 2014: Multiple selections now supported for xref path and type changes. LT2014 FILETABTHUMBHOVER: Specifies whether the model or layout loads in the drawing window when you hover over a file tab thumbnail. LT2014 FILETABPREVIEW: Controls the type of preview, list view or thumbnail view, when you hover over a file tab. LT2014 New Variable HPPICKMODE: Sets whether the default method for identifying what to hatch is to select a point or to select an object. LT2014's FILLET: Now fillets the first and last segments of an open polyline to create a closed object.